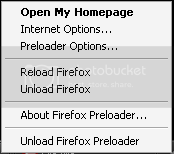 Firefox no doubt is the most widely used browser but it has a small drawback, it takes a lot of time to load. Even if you have a Core2Duo and 2GB RAM it will take a little bit of time to load. Well, the fact is that even Opera and IE loads faster than Firefox. Luckily, we have a great Windows app- Firefox Preloader which loads some parts of Firefox into memory before it is used to improve startup speed. You can also manage different Firefox versions with this app. This app certainly does speed up Firefox startup but it also does consume a lot of memory. If you are having a 512MB or a GB of RAM then you don’t need to worry about.